Straight leg raises are a great quad and hip flexor exercise. They can be used to strengthen the knee, and you can increase the intensity by adding ankle weights. The quads are a major stabilizer of the knee and straight leg raises can be used to re-train the quad muscles after a knee injury. Even without weights, straight leg raises can strengthen the knee, and most people should begin with no weights. Physical Therapists often use straight leg raises to help people recover from knee injuries, so this exercise is great for both men and women. Note: If you have knee pain you should consult with a licensed health care professional. Below are pictures of straight leg raises with ankle weights. Starting Position: Attach an ankle weight to your leg and then lay on your back. Bend the opposite knee so that your foot is flat on the floor. Form: First, contract and tense up your quad muscle (the front of your thigh). While keeping your thigh contracted and your knee straight, lift your leg off the floor until your thighs are parallel with each other. Pause for a brief moment at the top and then slowly return to the starting position. Personal Trainer Tips: There are 2 major keys to performing this exercise correctly. First, you must make sure that you contract your quad muscle before you lift your leg and you must keep your thigh tensed throughout the entire range of motion. The second key is to make sure that your knee is completely straight through the entire range of motion. When you get fatigued or when the quad is not strong, there will be a tendency for the knee to bend slightly. Focus on keeping your thigh tensed and move in a slow and controlled motion. Some ankle weights are adjustable, start with 1 pound and work your way up from there. Perform 10-15 repetitions on each leg for 1-3 sets. 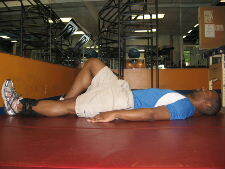 The straight leg raise is used often in physical therapy to strengthen and stabilize the knee joint. If you've mastered this exercise without weights you can add ankle weights. 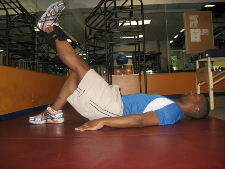 You can also use ankle weights to strengthen the other hip muscles as well. And the great thing about ankle weights is that they are inexpensive and you can use them in your home. So if you're looking for a quick way to strengthen your hips, pick up some ankle weights or look for them in your gym.